The Boston Globe examined fire response times by looking at public records of fires reported by fire departments across the United States to a federal database, the National Fire Incident Reporting System. If you have questions or wish to respond to this series, send an e-mail to Bill Dedman at Dedman@Globe.com. Read the transcript of Bill Dedman's Feb. 1, 2005, chat with Boston.com users about this series. While cities and towns are closing fire stations, America's firefighters are taking longer to get to fires. This first installment of a Boston Globe investigation examines the effect on public safety. Concord -- like Carlisle, Boxford, and many affluent suburbs around Boston and other US cities -- has too few fire stations and too few firefighters to protect all of the town. Who is watching the fire department? Homebuyers can do their homework when choosing a community for their dream home. It's easy to check the Web for a community's crime rate, tax rate, and school test scores. But who is monitoring the performance of fire departments? Are your community's resources adequate? Find out for yourself by asking your fire chief these questions. Fire departments are not only taking longer to get to fires, but often arrive at the scene with too few people to do the job safely. Such inadequate response increases property damage from fires and endangers occupants as well as firefighters. 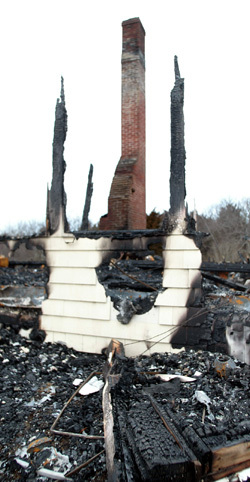 Nearly once a day in Massachusetts, a fire department puts out a building fire by itself although a neighboring town has a closer fire station, the Globe determined, using computer maps showing fire locations over the past decade. A computer simulation by the Globe illustrates the scale of the state's deficit in fire stations and gives a glimpse of the potential cost-savings if communities worked together. The high public regard for firefighters is not always reflected in municipal budgets, especially in areas outside the big cities. Firefighters appreciate public respect. But that alone can't keep the engines running. In 52 fires where firefighters died, only 18 got a full force of firefighters in the first 10 minutes, The Boston Globe found. Here are details on each fire. The US Fire Administration says it will conduct a national study of how long fire departments take to respond to fire alarms, and whether delays are contributing to deaths. WASHINGTON -- In a rare show of unity by fire chiefs and firefighters, a coalition of national fire organizations called on Congress and the Bush administration yesterday to increase funding and respect for America's fire service. Roy Jones has been putting out fires in Brewster for 40 years, but now he seems to have started one. GLOBE WEST: Can fire station be saved? It's a problem that would make any homeowner's palms sweat. A beautiful old home's floor is too weak to support the furniture. But, in this case, the home is a 115-year-old fire station and the ''furniture" is a 42,000-pound ladder truck. WOBURN -- Two firefighters have been suspended for a week without pay after city officials investigated the response time of an ambulance to the Woburn home of a Reading police officer who was having a fatal heart attack. The fire hydrant near 48 South Border Road in Medford has been leaking for at least three years. Five months after Norfolk began operating an ambulance staffed with paramedics, town officials are crediting them with saving the lives of at least five residents who were close to death. The town of Boylston may hire a second full-time firefighter, a move aimed at strengthening a department that relies mainly on volunteers. The green plastic shades are always down, the door is locked, and the bulldog poster outside suggests that a sinister dog lives inside the station for Engine 7. The Lawrence Fire Department faces a far different landscape from a decade ago. According to the latest state Fire Marshal records, the department received 6,958 calls in 2003, 93 percent of them false alarms, medical calls, and other non-life-threatening situations. When two emergency dispatchers were videotaped using drugs at work last November, the scandal marred the Fire Department and its emergency call center. Engine 5, the busiest firetruck company in Lawrence, rumbles through a city enveloped by a blanket of silence during the night. Housed at the Lowell Street central station, Engine 5 is the queen bee that accompanies trucks called from the city's six other stations. Gloucester has routinely neglected its responsibility to help neighboring communities battle blazes, records show, even six months after the regional fire chief's association sent the city an unusual letter questioning the Fire Department's commitment. They are among the richest towns south of Boston. But Hingham's Fire Department is down 11 firefighters since 1989, the station in the center of Norwell will have only one firefighter on duty during ambulance calls, and Cohasset officials doubt they can reopen two stations closed in the 1980s, even though they say the Greenbush commuter rail line, now under construction, will probably slow response times. Take heart, Bostonians: Your fire engines are running on time. The national gold standard for communities is that they should respond to fires within at least six minutes 90 percent of the time. Boston's departments arrive on time 97.7 percent of the time. That's a track record that many suburbs cannot match. Gloucester, like many communities north of Boston, has responded to tough economic times by laying off firefighters and shutting stations. It has the slowest fire response rate from 1986-2002. Yet the region's second largest, Haverhill, has one of the best track records. In the quickly growing town of Boxborough, where million-dollar homes are popping up like mushrooms, there is just a single pair of firefighters on duty at any given time -- and they are responsible for both the ambulance and fire service. If those two men are busy, residents are going to have to settle in for a wait. When a fire breaks out, everything will be in the Berlin firehouse -- except firefighters. Volunteers will have to race to the station from their jobs or homes to jump on the trucks. And that takes time, which is precious when flames are spreading. Slow response times by firefighters have become increasingly common in fast growing Plymouth. But people who choose to build their dream homes far from traffic-clogged urban areas can also find themselves a long way from a fire station.